Great new feature. Notification is a nice touch. I'll request, too, that really unusual activity or changes generate email alerts. Much like credit cards. So a spike in emails sent for instance, which might indicate a trojan hijacking, would result in an immediate alert. I subscribed to the service. My report was ready 5 mins after the request! Where are the full stats. This makes it seem like Google just casualy dumps a few recent things into a report. It's not like there aren't a million more details that they store and it's not like Google didn't build a more intelligent tool to analyze that data, it's just that those parts aren't supposed to be seen by the user. If people could see their own full information in the way that advertisers or the government can see that same information, people would be flipping their sh*t.
About Chrome browser, yesterday the new tab page displayed a new button shortcut to the Chrome webstore (bottom right, next to the recently closed pages). Today, this button is gone. Did anybody else notice this ? 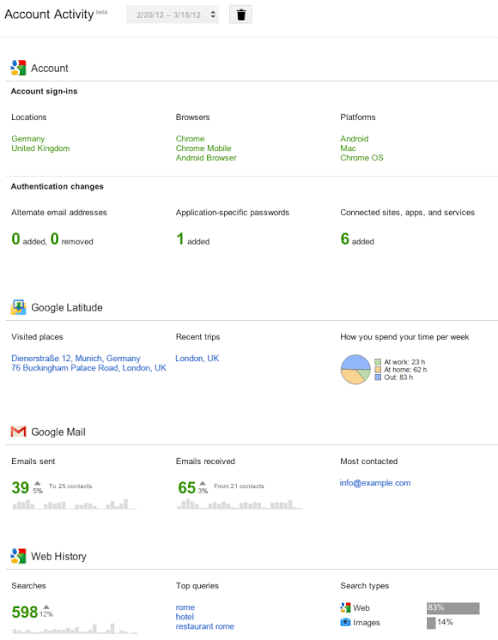 While this feature is good to just check how much you are using Google services it is also great for security as you can see if there was some emails sent, some unauthorized authentication etc.